I'm not from DC, but one of our boys goes to college there and until recently, was a host at one of the Founding Farmers nearest the White House and for the last year or so, he's been raving about the food, insisting that we had to go the next time we were down there. Finally this summer we managed celebrated with a post-move-in-to-the-dorm "lunch" that all of us are still thinking about!! I say "lunch" because employees get a big discount so we might have gone a little overboard. Let's just say that hot fresh pretzels with three dipping sauces, paella, a fabulous cheeseburger, honey fried chicken, mussels, steak and and enormous brownie sundae with homemade ice cream were entirely consumed at the meal...and that was just me! No, but seriously it was AMAZING!! Before I get to the recipe I just want to tell you a teensy bit more about the restaurant because the concept for it is so interesting. Basically, the members of the North Dakota Farmers Union partnered with two businessmen to bring their products directly to the consumer, which means that there are over47,000 family farmers who own a majority share in the restaurants! This also means that cooking is seasonal and freshly prepared, down to the bread. Yum! And because I loved the food there so much, my darling boy got me a copy of the cookbook for my birthday, which means I can recreate all that happy food at home now! Like these wings (I know, finally). They're crispy, spicy and super easy to make. I also love that they're not fried, partly because I hate frying things and partly because they're healthier and so I feel less guilty eating them (there's that happiness again) They're intensely flavorful too and that's because they take a nice long refrigerated rest in a simple peppery marinade and then a toss in a sweet, peppery glaze once they're cooked. Worth those messy fingers!! So if you get a chance to get to DC, make sure you head to one of the Founding Farmers restaurants (and try to make a reservation--they get packed a la Cheesecake Factory) or at the very least pick up a copy of their cookbook and start making some happy in your kitchen too. Have a great weekend and I'll be back next week with more of my favorites for you. Can you believe it's less than a month to Thanksgiving?!! 1. Place all of the ingredients for the marinade except the wings in a medium bowl and whisk together well. Place the wings in a resealable bag or in a container with a lid and pour the marinade over them, making sure to coat all the wings well. Chill in the fridge for at least 6 hours and better yet, overnight. 2. Preheat oven to 425ºF and place a wire rack on top of a rimmed baking sheet. Remove the wings from the marinade, draining them slightly and throw away the marinade. Arrange the wings on the rack, spacing them not too close to each other and bake for at least 30 minutes or until wings are cooked through and black patches of caramelization have begun--I had to cook mine closer to 45 minutes but that's partly because we're well-done fanatics. 3. While wings are cooking prepare the glaze: Place both sugars and the soy sauce in a small saucepan and combine. Heat over medium heat until mixture simmers and sugar is dissolved. Remove from the heat and stir in garlic, chili paste, rice vinegar, salt and pepper. 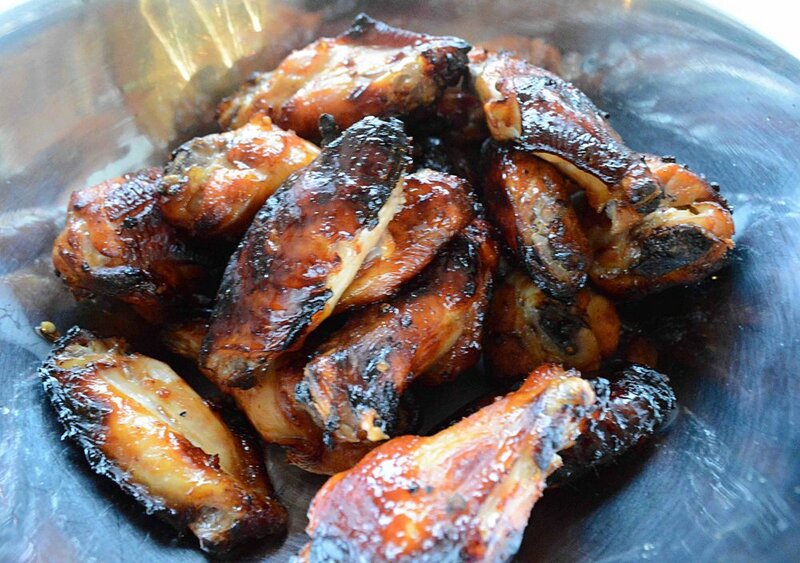 When wings are cooked, transfer them to a large bowl and pour the glaze over them, tossing well to coat. 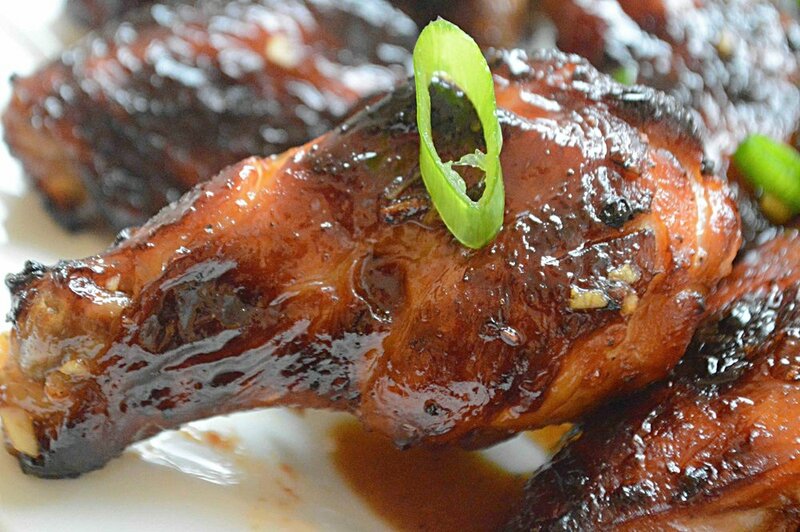 Place the wings on a plate, garnish with the scallions and serve immediately. Note: Recipe adapted from The Founding Farmers Cookbook.